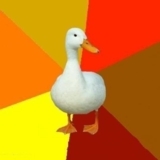 Many memes include both “advice” and “dog” in their titles and definitions. So many, in fact, there are too many to list. But Advice Dog is one of the main memes, acting as an umbrella to numerous sub-memes and derivatives. 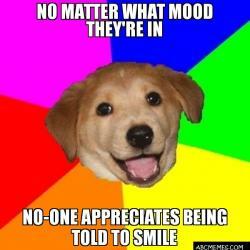 Advice Dog has been around since about 2006. A cute dog is shown at the forefront of multi-colored wheel, spouting non-sequitor advice and silly life instructions. Though unverified, there is some speculation that Advice Dog is named Boba Fett, and is a bounty hunting dog contracted out by none other than Darth Vader, natch. Some notable quotes from the Advice Dog himself include: “Walk up to a small child that resembles you – tell them that you are them from the future” and “Watch ponies – realize it’s 6 AM”. Advice Dog is rather sanguine about his existence, stating that “Being a dog is so nice – I’m dying in 10 years”. 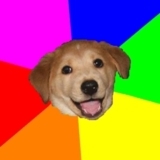 Chances are, however, that Advice Dog will be around for many years to come, spreading the joy of meme-dom to hilarity-seeking individuals everywhere. The Advice Dog spinoffs are so prevalent and numerous, there has been some suggestion of retiring him and sending him off to a nice farm in the country, but his ubiquitous presence on the internet demonstrates that his shelf-life will be an extended one, possibly surpassing even that of Twinkies. 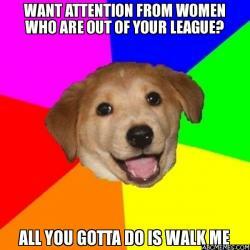 Advice Dog is pretty adorable, and always good for a laugh.